The 6th Annual General Meeting of TAC Security, India & USA based cyber security solutions provider was held at Taj Hotel, Chandigarh. 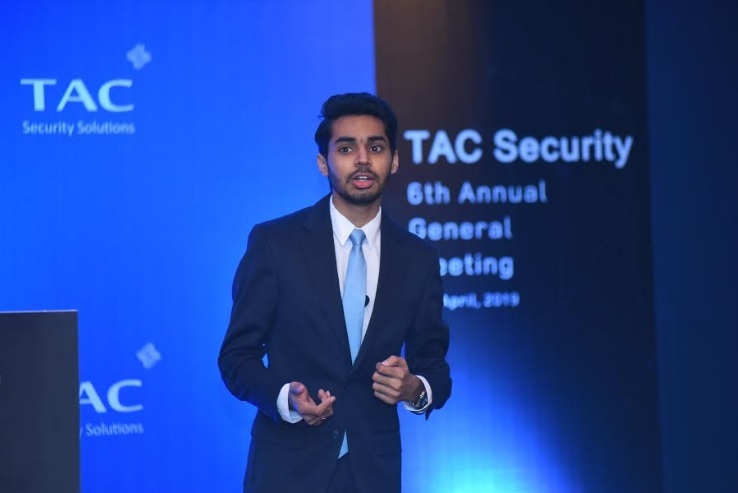 All eyes were on Mr. Trishneet Arora, Founder and CEO of TAC Security while he made series of announcements for TAC Security’s successful fiscal year of 2018-19. TAC Security is a leading and trusted cyber security consulting partner that specializes in securing the IT infrastructure and assets of some of the leading enterprises globally. It protects Rs. 1 Trillion transactions every year. TAC Security is India’s first cyber security company to be involved in policy making and strategizing of the cyber security policies for a sensitive law enforcement agency in the United States of America. ESOF (Enterprise Security in One Framework) a product by TAC Security is said to be a revolutionary game changer in the cyber security industry and assures safe and time saving results. ESOF's major targets are banks, large enterprises, healthcare and government departments and defense. TAC Security has already sold the platform to existing customers and few new clients from United States have started using it. According to the latest reports the cyber security market in India is projected to grow at a CAGR of 19% during 2018-2023 and Growth in the market is expected to be driven by rising number of government initiatives towards digitizing government sector entities and processes, healthcare, BFSI, education and other vital sectors of the country, as per reports. TAC Security is keeping its eyes on having large number of customers and building brand in the market and expanding footprints geographically. TAC Security Solution is an industry leader and trusted cyber security partner for their clients to protect networks and information assets from malicious activity such as cyber-attacks with the underlying motto of "Securing Cyberspace:Securing Future." TAC Security - a cyber security startup empanelled by CERT-In, Ministry of Information Technology, Govt. of India. Helping the companies like - Bharti Airtel, Reliance Industries, National Payment Corporation of India (NPCI), AMUL, Punjab & Sind Bank and various Government Agencies, etc. to achieve confidence in the security of their IT Infrastructure. In 2016, TAC Security raised Pre-Series ‘A’ funding from Prominent Indian Investor Vijay Kedia prior to this TAC Security had inducted Subinder Khurana Former Vice President of Cognizant on its board. In 2017, Singapore based former regional sales director of Imperva, Lawrence Ang and US based former Vice President of IBM, William May backed TAC Security.